Christmas cards today usually feature a jolly Santa or green glittery trees, but Victorian versions had a much more terrifying tone. 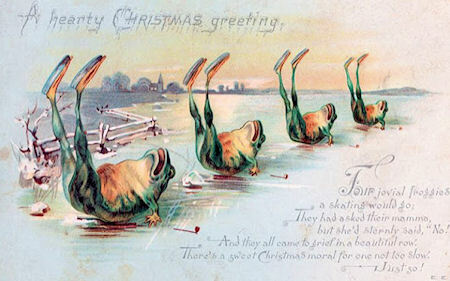 The Victorians had a different idea to what Christmas was about - not particularly Christian, but a time of good humor. The cards were not only overwhelmingly secular, but some were grimly non-festive. Rosy-faced children gathered round a decorated tree might be seen on a card - but so might a dead robin or a turnip wearing a hat.